Denis Menchov (Katusha) finished the Tour de France in 15th place overall, but given his good start to the race, his Katusha team management ended up disappointed in the Russian’s final result. Menchov began the Tour lurking quietly and dangerously. He was a solid eighth in the prologue and stayed out of trouble after that, avoiding all the big crashes of the first week. On the first real uphill test, stage 7 to La Planche des Belles Filles, Menchov hung in well, coming in ninth and losing 48 seconds to eventual race winner Bradley Wiggins (Sky Procycling). After taking ninth on the first long time trial, it all came crashing down for Menchov on stage 11 to La Toussuire. The Russian lost 13 minutes to the overall leaders, coming home 41st on the stage and losing all hope for a high finish in Paris. After originally looking to be a solid bet for a top five finish in Paris, Menchov ended up 15th, just four places in front of Katusha team-mate Eduard Vorganov, who had never previously figured into the general classification in a Grand Tour. “I am pretty satisfied with the result of our Russian champion Eduard Vorganov,” team manager Hans Holczer assessed. “His top 20 in the GC was not something planned, so it was a nice surprise. Eduard is a really strong rider, a very good team rider, who rode a very good race. Holczer indicated that he had the Vuelta a España circled on his calendar, and he maintained a positive outlook on the rest of the season. 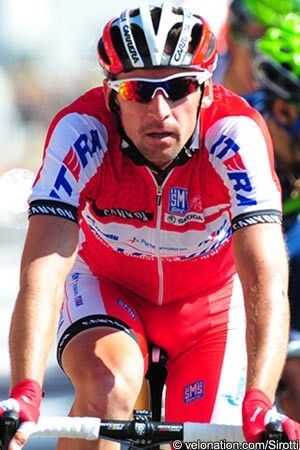 Team leader Joaquim Rodriguez is expected to figure in heavily to the final Grand Tour of the season. The Dutch wildcard squad Argos-Shimano was set back early with the illness of star sprinter Marcel Kittel. The German was never able to take part in a sprint before he dropped out during stage five. Tom Veelers stepped in admirably, earning Argos-Shimano its best results. Veelers was fourth in the stage two sprint before grabbing third in stage four to Rouen. After Veelers and Johannes Fröhlinger dropped out, the remaining riders aimed for breakaways, with mixed results, which team manager Iwan Spekenbrink spoke of in Paris. “I look back on this Tour with pride, although there are mixed feelings. The things that we could control have all gone according to plan,” Spekenbrink stated. “In the flat stages, we thought we could compete for a win, and we achieved a high level. Despite the withdrawal of Marcel we could use six men in the last kilometre. Tom Veelers finished off the teamwork with a third, fourth and sixth place. For Euskaltel-Euskadi, upon losing Samuel Sanchez to a stage eight crash, it became all about hunting stages. Gorka Izagirre was most impressive in his pursuit of a win, with his best result being third on stage 16. Team director Gorka Gerrikagoitia was pleased with the adjustments the Basque squad made after losing its team leader and several others. “We came to Liege with well defined objectives, but with the loss of four riders, including our leader, everything changed,” the Basque boss said. “With Samuel in the race we had a strong leader to fight for the podium and achieve a stage win. It was an ambitious challenge, but with the abandonment of Samuel, it had to change. The five riders who have made it to Paris have responded and produced a worthy Tour.